Extreme piety, witch burnings, frequent executions, countless legends of brave knights, clever folk heroes, fairytale-like villages, charming towns, bloody wars, stories of the rise and fall of many kings and queens, large fortresses that dot the landscapes, and of course, breathtaking castles. Yes, we are talking about the Middle Ages, a period of roughly 1,000 years full of events, historical figures, and exquisite pieces of architecture. It’s time to focus more on medieval architecture. Or, more precisely, to share with you the secrets of medieval castle designs. Primarily built for the purpose of protection, these magnificent structures defined an entire era and most certainly shaped the course of history. To say that medieval castles are very complex structures is clearly not enough, and that is why we need to have a look at the details of these defensive fortifications. 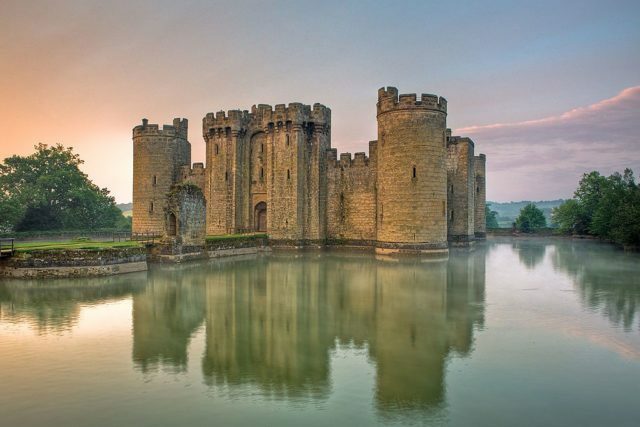 One of the most important elements used in the defense of a medieval castle is without a doubt the moat, a wide, deep body of water that surrounds the castle. Apart from being an impressive sight to behold and a perfect obstacle to slow down the advance of enemy armies, the castle moat’s most important function was to prevent any attackers from digging tunnels. Castles without moats often faced the risk of being attacked from below. Invaders would dig a tunnel under the walls that could eventually help them penetrate the castle by causing the wall to collapse. A moat was the perfect defensive mechanism against tunnel digging, as it would likely collapse and the tunnel would be filled with water before the invaders could undermine the castle wall. Developed in around the 13th century, this extraordinary method of defense offered the best protection against enemy attacks. The concentric multiple lines of defensive obstacles made the castle way more secure than any other defensive design of the past. As we all know, the word concentric means that one circle is inside another, and in the case of the medieval castle this meant that the attacking army had to primarily overcome the outer wall or earthworks, but even if the soldiers did, that didn’t mean that the battle was over. Their next obstacle would be the castle moat and then the inner wall, which would bring them to their last obstacle, the keep tower within the castle. Another exceptional defensive addition to the medieval castle was the main gate. One might think that the main gate was the most vulnerable part of the medieval castle, but the fact is that this structure was among the most heavily guarded spots, and additionally it was one of the most dangerous places as it was often filled with obstacles and deadly traps. With the help of an iron portcullis, the attackers could easily find themselves trapped in a small courtyard between the inner and outer gates. There was no way out–the unfortunate assailants could easily be attacked by archers positioned on top of the gatehouse, as well as having stones, boiling water, or hot oil dropped on them through the meurtrières (murder holes). If you have ever visited a medieval castle, you might have noticed that the stairwells are designed as a clockwise spiral. There is a very good reason why medieval castle designers chose to build them this way, and again it is all about defense. According to Will Kalif of All Things Medieval, “this meant that any attackers coming up the stairs had their sword hands (right hand) against the interior curve of the wall and this made it very difficult for them to swing their swords.” On the other hand, the defenders could easily swing their swords and additionally, thanks to this specific design, their bodies were exposed much less than the bodies of their enemies. A practice known since ancient times, creating secret passages and secret chambers was nothing new during the medieval times, when secret passages were an integral part of the design of most castles. If besieged, the inhabitants of the castle could use these secret passages to get additional supplies or to escape safely if the attackers captured the castle. The inhabitants could use the secret chambers to hide or to store supplies and water.